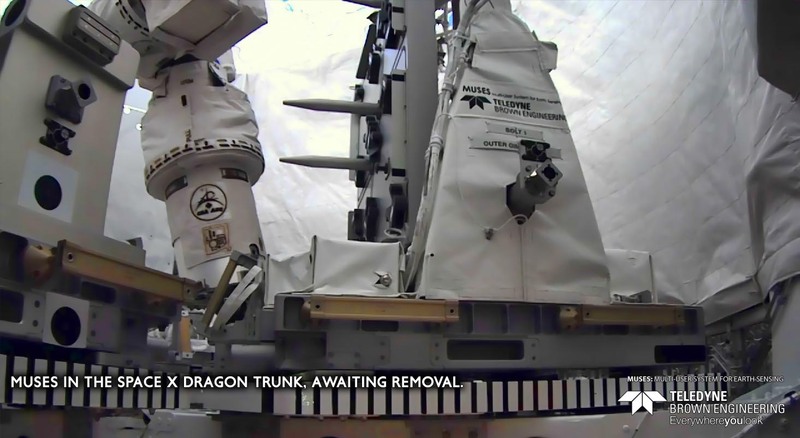 MUSES in the SpaceX Dragon trunk, awaiting removal. The Multiple User System for Earth Sensing (MUSES) is a commercially operated hosted-payload platform that provides a test bed for technology demonstrations and readiness maturation in low Earth orbit (LEO). MUSES pointing capability supports the hosting of Earth-viewing instruments, such as high-resolution digital cameras and hyperspectral imagers, improving response times for natural disasters, weather and climate modeling, and environmental monitoring to track ocean health and water quality for harmful contaminants such as oil spills or agricultural run-off. To learn more about how the ISS National Lab is working with partners in the areas of Earth science and remote sensing, visit our Areas of Research Page. Envision being able to validate that a new imager works before risking it on a satellite launch—and, if it doesn’t, being able to easily return the sensor to Earth for testing and repair. Picture being able to have your payload in orbit in under 12 months at half the price of traditional small satellites. With MUSES, we can take a new imager or technology and verify its performance. The development of new space-based technology can be accelerated with greatly reduced risk. The ability for payloads to orbit the Earth and return is now possible after the June launch of the Multiple User System for Earth Sensing (MUSES) platform to the International Space Station (ISS) U.S. National Laboratory. 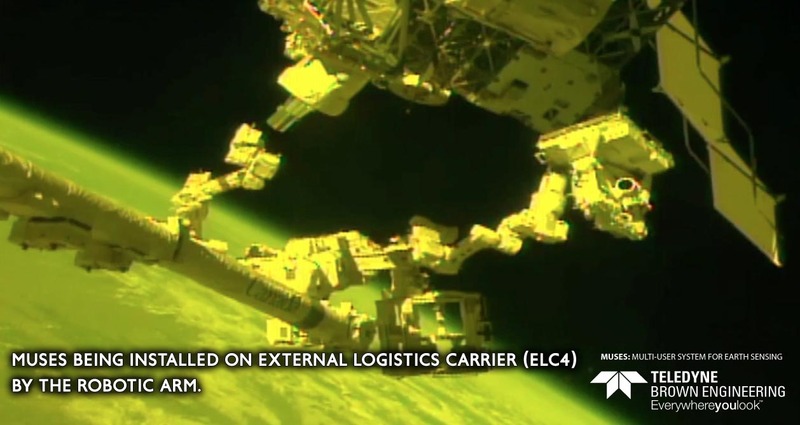 Leveraging the infrastructure of the ISS makes this new capability available at significantly lower cost than traditional satellite platforms. Orbiting approximately 250 miles above the Earth, the ISS offers researchers a unique vantage point for Earth observation, disaster response, maritime domain awareness, food security, atmospheric investigations, and other applications. In addition, because the station’s orbit is non-sun-synchronous, it allows for both day and nighttime imaging of the same location. 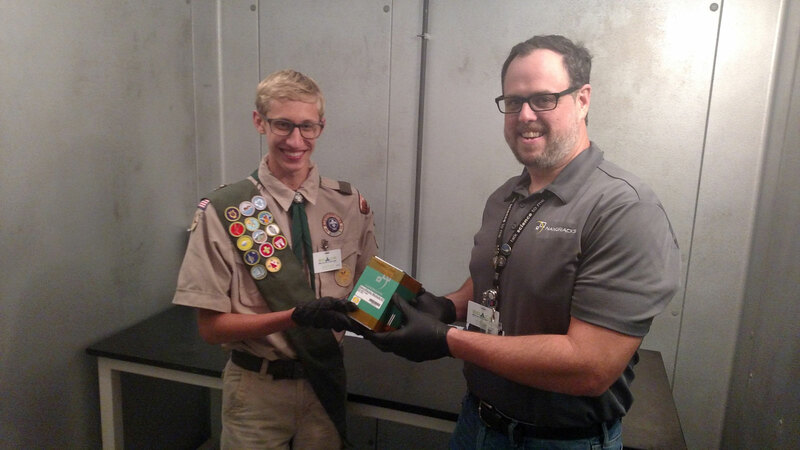 As the first commercially operated remote sensing hosted-payload platform on the ISS, MUSES is helping drive investment in a new low Earth orbit economy and attract commercial players to space, which is one goal of the ISS National Lab in its management of the ISS National Lab. “From our perspective, we see MUSES supporting traditional science applications for weather and climate as well as applications for commerce,” says David Zuniga, commercial innovation manager at the ISS National Lab. Built and operated by Teledyne Brown Engineering through a cooperative agreement with NASA, MUSES offers companies, academic institutions, and government agencies a platform and test bed for experiments and technology demonstration, lowering the risk traditionally associated with sending new sensors or payloads into space via satellite launch. It joins a growing list of commercial platforms on the ISS, including NanoRacks’ cubesat deployer (NRCSD) platform and Alpha Space’s Materials International Space Station Experiment Flight Facility (MISSE FF) materials testing and data collection platform. DLR, the German Aerospace Center, will be the first customer to use MUSES. In early 2018, DLR’s Earth Sensing Imaging Spectrometer (DESIS) will deploy and enable the monitoring of ecosystems, water quality in coastal zones and oceans, and vegetation development trends, such as determining if there are good conditions for vegetation to grow while bridging the gaps between geostudies already done on Earth. DLR has been working on the hyperspectral instrument for the past four years but has more than a 17-year history working multi-spectral instruments and optical sensor systems. The aerospace center plans to merge data from an instrument already in synchronous orbit on a GEO satellite with the instrument on MUSES. Because MUSES flies in a non-synchronized orbit, DLR scientists can capture data of the Earth from different angles. MUSES also will provide Earth imagery data to NASA’s SERVIR team, providing disaster response information to assist the team’s humanitarian missions and to improve environmental decision-making among developing nations. Ickes says there is always risk that new technology launched into space might not work on the first try. The development of space-based sensors is difficult, and many past satellites have failed or have limited operational performance. Repairs are not possible, and the investments made could be a total loss. The MUSES platform features four sensor slots, which can dynamically point to any area on Earth at a 50-degree range of motion while in flight without having to wait for the ISS to fly directly over a specific location. The MUSES platform will switch out sensors using the ISS robotic arm, giving Teledyne Brown Engineering the ability to support low Earth orbit experiments of various time lengths, customized to the specific mission. MUSES is ideal for Earth observation initiatives, currently estimated to be a $43 billion market, with capabilities from assessing weather patterns and climate to driving business intelligence. Instruments on the platform will be able to detect flooding and coastal erosion as well as water pollution, red tide, and landslides. MUSES also will be a critical tool in disaster response. What excites Zuniga the most is the potential for MUSES to help integrate or fuse different data sets together in a tangible way that helps people on the ground, such as combining weather and climate information to better plan for or prevent flooding, leading to fewer fatalities, less severe property damage, and less costly insurance claims. “In the end it’s all about data—how to use data analytics to process all this information and make data packages or application protocol interfaces for people like you and me to use,” Zuniga says. Teledyne Brown Engineering developed the Multiple User System for Earth Sensing (MUSES), to provide a test bed for technology demonstration and technology maturation in low Earth orbit. MUSES hosts Earth-viewing instruments (hosted payloads), such as high-resolution digital cameras and hyperspectral imagers. Learn more about DESIS—the German Aerospace Center’s Hyperspectral Sensor for MUSES, including system features and performance specs. Watch a video produced with Teledyne Brown Engineering on how DESIS will provide a more colorful view of Earth and the applications that will be possible.